We love to call it slacktivism but companies like Tom’s shoes have made it so easy to give back just by purchasing their product. Now we’ve learned that Gripcase, the company that makes the iPad case our 6 year old ISTE correspondent loved, has applied the same model to their line of iPad cases for kids. What’s unique about Gripcase’s Buy One Give One campaign is that it’s designed to get their product into the hands of school children in schools across the country. Through programs like the Obama Administration’s ConnectEd initiative, more and more schools are getting access to technology, even tablets and iPads. But schools that need that technology the most aren’t necessarily opting for cases that may protect that technology the longest. 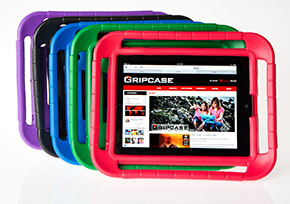 The GripCase is designed to withstand the rigorous torture that young students can put on an iPad or tablet. It’s unique design absorbs the shock from a drop insuring that the energy transfer from a fall doesn’t end up shattering that tablet. Gripcase has made their Buy One Give One program as easy as it is to sign up to help your neighborhood school at target. Simply purchase your Gripcase here at gripcase.com and in the checkout process select any school you want to donate a Gripcase too, even your son, daughter or relative’s school. Schools are making the most out of iPads in the classroom. There are schools that are still using the original iPad in the classroom and they’re functioning just fine. GripCase can protect iPads for many years insuring that students get access to the technology they need to learn in today’s modern world. Gripcase is on a mission to protect every iPad in school (and every kids iPad at home) they know it’s a lofty mission but with programs like this they are well on their way. Find out more about Gripcase’s Buy One Give One Program here. Order your Gripcase and support a school here.